Almo Nature Classic & HFC Kitten - with Chicken food is a delicious meal for young cats, which consists only of pure ingredients. Please note: The name of this product has been changed, but the ingredients are still the same. 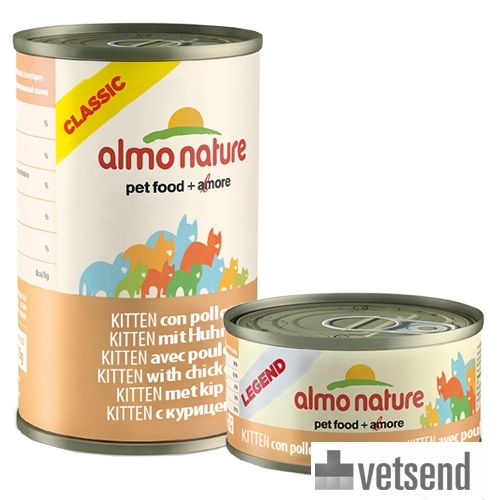 Created specially for kittens, Almo Nature presents the Almo Nature Classic Kitten - with Chicken food. This yummy and classic canned food is prepared with natural ingredients, and consists of a high percentage of fresh meat to meet the needs of kittens. The quality of Classic and HFC is the same, however, the HFC range from Almo Nature has a higher percentage of meat compared to the Classics range, which is lower in calories. The meat used in this food is free of any antibiotics and/or hormones used during breeding. It is also cut and cooked without chemical treatments, before being preserved in its own cooking water. This is to maintain the natural energy and flavour of the meat. These meals do have any added minerals, vitamins or additives, because they are already naturally rich in them. Almo Nature does not add any chemical preservatives and colourings to make the food appear more attractive. Because of its simplicity and authenticity this food has become a true classic that is well suited to any kitten's taste. Some products that used to be under the name Classic have since changed their name to HFC . Unfortunately, these are not yet fully implemented in all countries that sell Almo Nature. It may be the case therefore that you receive a product in the old packaging. Almo Nature Classic Kitten is available in 24 cans of 70 grams or in 24 cans of 140 grams. Have you used Almo Nature - Classic & HFC Kitten Food before? Let us know what you think about this product.